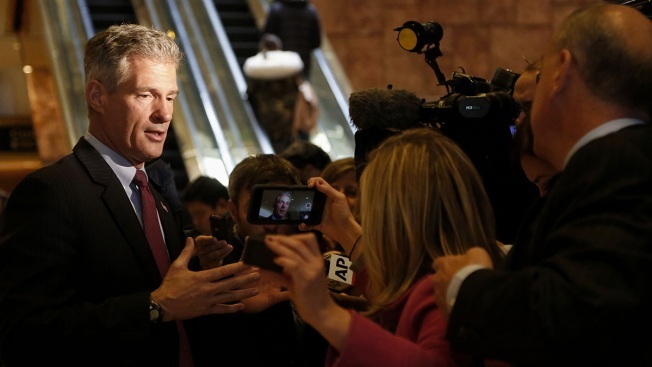 Former Massachusetts Sen. Scott Brown met with President-elect Donald Trump at Trump Tower in New York City on Monday morning. He said they discussed the possibility of Brown serving as the U.S. Secretary of Veterans Affairs. "It was a great meeting with the President-elect," Brown said afterward. "He's focused. He's got one meeting after another, after another. We obviously spoke about my passion and his passion - which are veterans and veterans issues." Brown called the Secretary of Veterans Affairs "the toughest job in the cabinet," as people's lives depend on whether the job is being done and done well. 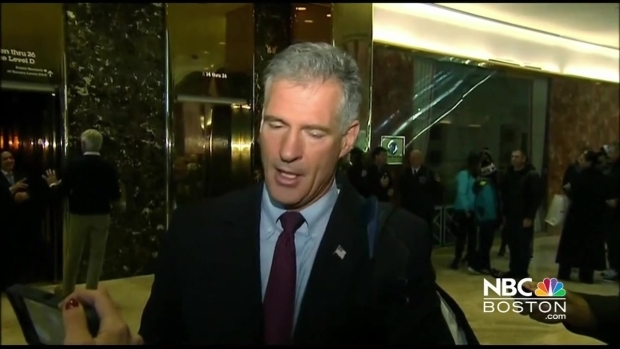 Scott Brown addressed members of the media following a meeting with Donald Trump at Trump Tower in NYC. Brown has said he's interested in leading Veterans Affairs. "While it has so many angels working there, it has so many great problems as well," he said. Brown - who moved to New Hampshire in 2014 to run for Senate there - was an early supporter of Trump, who won the New Hampshire Primary last February. Trump will now take Brown's "application" under consideration, and Brown said he expects to hear something after Thanksgiving. "I'm glad he called." He said he knows others are being considered, but he doesn't see it as a competition. "I'm not competing with anybody," Brown said. "I think I'm the best person." Brown served in the National Guard for 35 years, and served on the Senate Armed Services and Veterans Affairs Committees during his time in the U.S. Senate. "I've been in the military since 19," he said. "It's someting I feel very passionate about. These are soldiers and airmen and Marines that are doing our country's business." Brown had said last week that Trump was seriously considering him for a cabinet position. He said at the time that the VA and housing were potential areas of interest. Some New England Republicans who come from the more moderate, establishment wing have suggested that Brown would be a good addition to the Trump team, as he is, in some ways, an outsider now, though he does still know how the Washington system works.